How do you improve the world’s first and most powerful repository software? Keep innovating. As the first professional software platform for building high quality OAI-compliant repositories, EPrints is already established as the easiest and fastest way to set up repositories of open access research literature, scientific data, theses, reports and multimedia. EPrints 3 is a major leap forward in functionality, giving even more control and flexibility to repository managers, depositors, researchers and technical administrators. 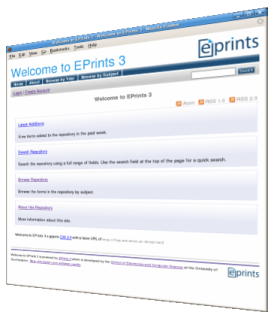 Try out the new features of EPrints 3 online with our demonstration repository, watch feature videos or see a slideshow PDF of the features of the software. Lower the barrier for your depositors while improving metadata quality and the value of your collection. A better platform for a high quality repository. Backed by a support team with expertise in the research, library and publishing industries, EPrints 3 is the platform for a variety of open source, bespoke and hosted repository solutions.